I have partnered with Different Drummer to share the She is Noble campaign. The campaign is designed to honor and celebrate inspirational women who change the world around them. WIN a trip to Ireland for you and $10K for a Noble Woman. You have until April 27 to make a nomination. If your story is published you will receive a $25 Amazon Gift Card. We all know at least one incredible woman that has made an impact on us. Who do you know that had made the world a better place? Raise your hand if you know a survivor, a warrior, a living saint. Let us recognize the women who are the unsung heroes in our lives. I invite you to share stories of courage and compassion about a woman that you know and admire. 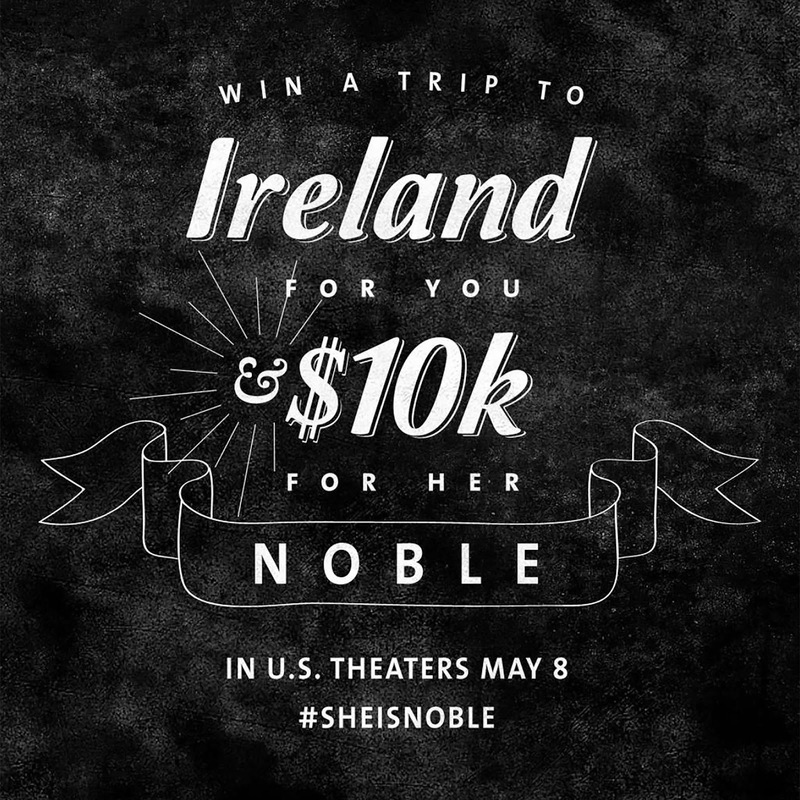 WIN a trip to Ireland for you and $10K for a Noble Woman. 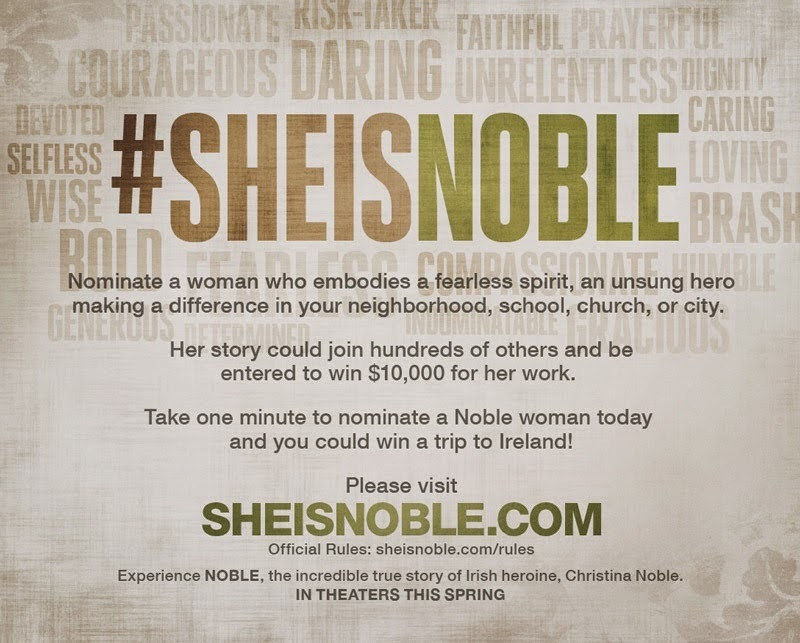 To enter, visit the She is Noble website: http://www.sheisnoble.com to nominate a heroic woman by explaining in 150 words: ‘She is Noble because...’ When prompted for REFERRAL CODE please enter lifebycynthia. - The contestant who submits the winning nominee will get a free 5-day/4-night trip to Ireland. - The winning nominee gets $10,000 toward the charity of her choice. If your submission is published on the She is Noble website, you and I will each receive a $25 Amazon gift card! The contestant who sends in the winning submission will receive a free 5-day/4-night trip for two to Ireland! The winning nominee (the unsung hero) will receive $10,000 to be applied toward her work. She is Noble is inspired by the life of Christina Noble, an Irish woman who traveled to Vietnam after experiencing an unforgettable dream. As a result of her journey, she rescued millions of abused and homeless children. Her story is told in the new movie NOBLE, coming to theaters Spring 2015. The contest will close at 11:59PM EST on Monday, April 27th. The winners will be notified on or about April 28, 2015, via email, phone or mail. Who is the noble woman in your life? For me, it is my mother. She is strength and grace bound by courage and faith. I love her, she is my hero. Please leave a comment about YOUR Noble Woman and let me know a little bit about her. We are all noble, even if in the seemingly smallest of ways. How do you share yourself and display noble feats? Disclosure: I will receive a $25 gift card for all referred published submissions that use my code: lifebycynthia on www.sheisnoble.com. All opinions are my own. I would love to win this trip. It would be so much fun. I wish that I could make a submission! I would nominate my Sister and Mom... The trip to Ireland would be amazing! I would love a trip to Ireland! Thanks for sharing! A trip to Ireland would be an amazing adventure. You're welcome! I love sharing campaigns that honor our unsung heros. Thank you for visiting. Awesome giveaway! I would have to nominate my mom. She has always been there for my sister and I and always supports us in what we do. Thank you BIsmah. I would nominate my Mom too! I hope that you decided to make a submission! I'd love to read all about how she is noble. It is such an inspiring campaign. I love reading about women in our world who make such a difference in our lives. debdenny, I think very highly of the campaign as well. I am so honored to have been chosen to share #SHEISNOBLE. This is an amazing campaign indeed. I believe the noble one are the ones that don't know they are noble. Thanks for sharing. Hi Rebecca. I agree with you - my mom would be the noble one that I would nominate and she would never describe herself that way. Many of the people that I consider noble are the most humble about it. My mom and sister are mins. Sounds like a great contest. This is a cool campaign. I wish my mom was still here. I miss her. What a dream come true for a very special person. This is really neat! A trip to Ireland is always something I would love anytime. The giveaway is just awesome & I would love to win it. Going to Ireland for someone sounds amazing. What a great opportunity for the person that gets to go.